Did you know that Halloween is perhaps the biggest holiday in Alaska? Behind only New Year’s, Summer Solstice, and Christmas, Halloween is huge. I grew up in Portland where you still look at people dressed up for halloween as a bit strange. I worked at a coffee shop for a couple years in Portland and it always struck me as funny when regulars would show up for their daily specialty coffee beverage dressed as a cowboy or a vampire when I’m used to them in their business casual. Casual Fridays were a whole different ballgame. Anyway, I developed a philosophy that regardless of what you dressed up as for Halloween, if you were an adult, you were dressed like a clown. 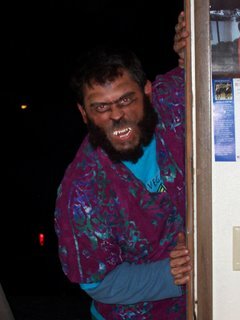 Something happened in 2004 that changed that idea enough to get me to don makeup and become a wolfman. Riche and I decided that it would be more fun to go big than to not go at all. I still wore my MKinMotion costume to work, but on the Saturday just before Halloween, we got freaky. Both of us are big fans of monster movies, so deciding on costumes wasn’t too difficult. 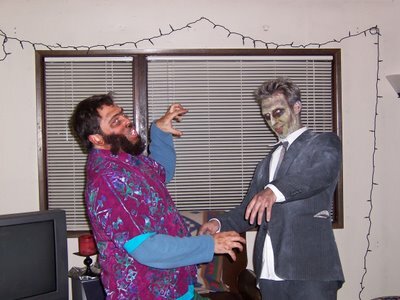 He chose to be a zombie…stage 3, if you’re familiar with the lingo. And I chose a wolfman. You can’t pronounce the soft ‘a’ in wolfman, though…the pronunciation sounds more like wulfmn…like Wilford Bremly would say it. If you know the legend of wolfmen, you know that they live fairly normal lives and then caught in the middle of their normal evening activities, bust out into a wolf person…there I got the gender sensitive title. Anyway, my character was on vacation somewhere tropical when he wolfed out. To make my long story end, I will say that when we went out on the town, we managed to catch The Whipsaws. I’ve mentioned this before, but I know you need a reminder. They’re playing the Rock Creek Tavern on Thursday night. If I were in Portland, I’d be dragging you there myself, but I’m not, so you’ll have to go on your own. I know, Portland readers are just part of my readers, but the Whipsaws are giving too many cities the privelege of hearing them live. You can however, pick up their CD from Portland based CD Baby. So here’s picture proof of a zombie and wolfman brawl and a little taste of the Whipsaws. There are some Seattle dates, if you’re interested, visit their myspace page. Then, yes Alaskans, they’re back in state.